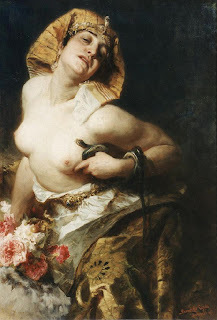 Not excactly a household name but a study of Cleopatra by Hungarian Gyula Benczur (1844 - 1920). Its an interesting and unusual portayal and was fun to explore. The first more serious study was done in the style and method of Prud'hon and the second was just a quick bit of fun with colour.